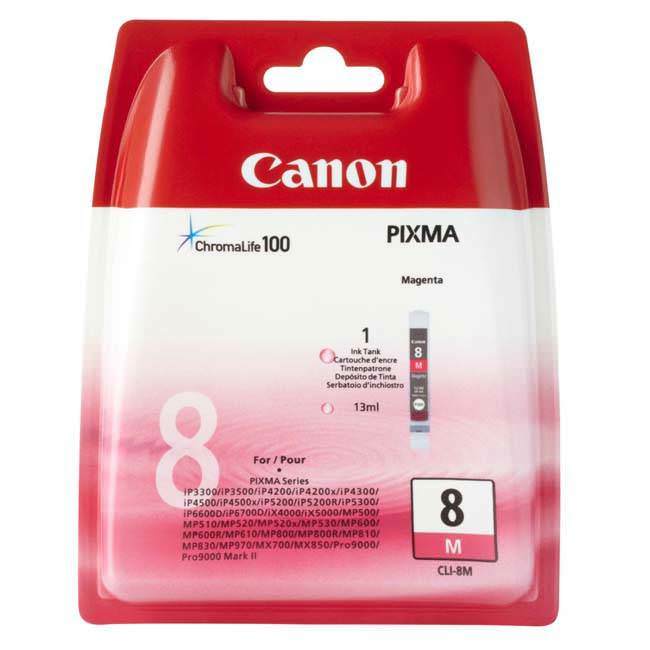 The original Canon CLI-8M magenta cartridges are popular cartridges in a wide range of Canon printers, including the Pixma MP600. The Canon CLI-8M magenta cartridge contains 13ml of ink and is designed to print around 670 pages at the standard 5% page coverage. The CLI8M cartridge is best used for photo printing and ideal for those looking to get the most out of their photo printing and like all Canon printers, the CLI8M cartridge will produce excellent quality results when printing. The CLI-8M includes Canon's ChromaLife 100 ink, a dye based ink designed to work perfectly with photo papers for improved quality. The ChromaLife 100 ink in the CLI8M cartridge has been designed to give longevity by being fade resistant, light resistant, gas resistant and works against heat and humidity over a sustained period of time. Thus ensuring not only quality prints in the short term, but the long term as well. The CLI-8M cartridge is therefore great value for money for any of the many Canon printers it is compatible with, all listed above. Our original Canon CLI-8M magenta cartridges for this range of Canon printers is amongst the lowest priced on the Internet.